Or, no room for spontaneity. Twice this past week I’ve been faced with range issues. The first was when I didn’t look at my schedule and see that I had a mid-day dentist appointment and had only filled the battery to 80%. That meant that I drove from Jericho to Burlington to Essex back to Burlington. I might have been able to make it home but opted to head to Healthy Living to give it an hour on a Level 2. Thankfully the spot was open and the wifi is great there so I got an extra hour and half of work done over dinner there. This was not a major inconvenience but of course if we had workplace charging it wouldn’t have been an issue at all. Hopefully this summer we’ll get some chargers installed. The second time was more problematic. I had run my Saturday errands; Jericho-Williston-Richmond and home only to have our younger daughter ask to go into Burlington, an unplanned trip. 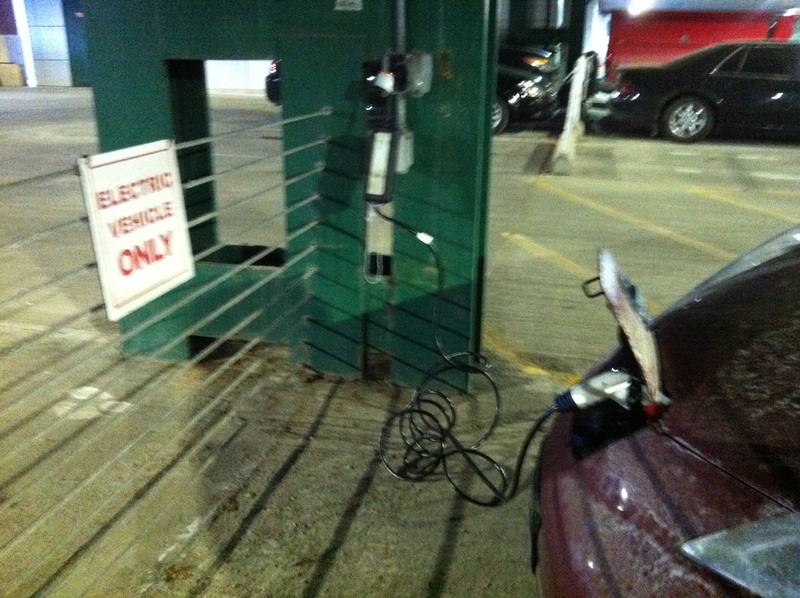 There was no range issue with the trip to Burlington and back (charging at City Market for the hour we were in town). The problem was when I had planned to return to Burlington to see a show and I saw that I only had 13 miles of range (it’s a 17 mile one way trip). If I had a Level 2 charger at home that would have taken care of that issue. The bigger problem was that our older daughter is home on spring break and had already taken off with the Jetta. Saying that she’s “home” on spring break is a bit misleading – her stuff is here and she makes an occasional appearance. I thought my husband would have been home since his day started quite early but he wasn’t. So what to do. I might have been able to make it since the descent from Jericho to Richmond adds a couple of miles of range. But this would also require that the City Market charging spot be available or less desirably so, the Church and Main Level 1 spot be open. In the end he came home a little earlier than planned and we met at the Richmond Park and Ride and exchanged cars, with a few choice words from him about the benefits of an ICE. Of course when I got in his car the low fuel light was on. I powered on and made the show and as I ran down Main St to the Flynn I passed the Church and Main Street charger only to see an ICE parked in the spot. I made the show, just and as a sign of thanks filled up the tank ($60!!!) before returning home. My mother made the comment during the show, “that car of yours really isn’t very convenient.” It is for about 98% of my trips and if I had workplace charging, a Level 2 at home and/or the 2013 model, which has ~20% more range, or a Tesla it would meet closer to 99.8%. I still think 2015 is the year for the EV breakthrough. In the meantime I’ll continue pioneering and remembering the mantra, Prior Planning Prevents Poor Performance. On Wednesday I traveled from Jericho to Montpelier to Burlington before catching a plane to DC. The new charging station next to the State House was a great place to park and charge during my meeting. My flight back was scheduled to arrive at 11:40 p.m. and knowing that we were expecting one more near or below zero night I wanted to make sure that I would have plenty of juice for a heated ride home. As I’ve mentioned before I’ve been ICE’d out of the great EV parking spaces at BTV three times previous so this time I decided to email my contact at BTV and inquire about the possibility of reserving one of the spots. In less than 5 minutes I got an email back with a photo showing them both available and an offer if they weren’t when I arrived to use some of the other plugs they have for block heaters. “Just let me know the make, model and color of your car and I’ll let them know.” So, I now feel confident that I’ll be able to access a plug at BTV. Now if they only offered a car wash as well.